Create simple chocolate and marshmallow treats before summer parties by making Chocolate Dipped S’mores on a Stick ahead of time. Hey there, Kenarry Readers! It’s me, Trish, here to add skewer free S’mores to your party menu. As much as I love roasting a marshmallow over an open fire there are often times we cross S’mores off of our BBQ lineup. Enter: Chocolate Dipped S’mores on a Stick. A treat that you can make ahead of summer gatherings and with a treat bag and a ribbon you can even share them as party favors. Preheat oven to 400F degrees then prepare a cookie sheet with parchment paper. Break graham crackers into squares, place them on prepared cookie sheet then top each graham cracker with a marshmallow. 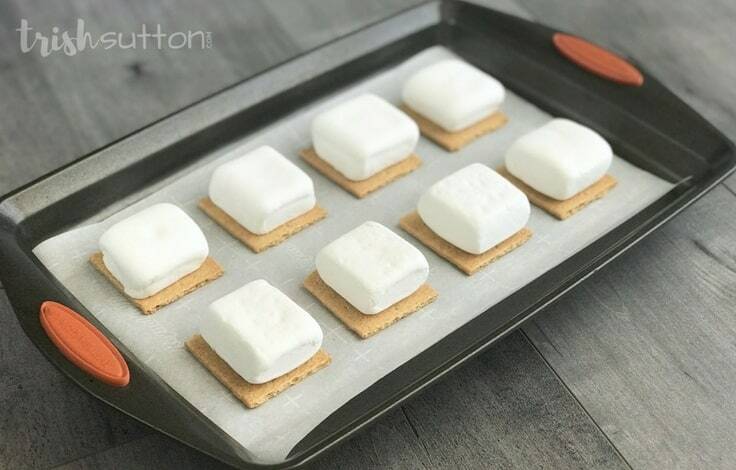 Bake marshmallow topped graham crackers for 3 minutes. The marshmallows should begin to puff; you may need to remove the pan a little earlier just as you may need to allow the marshmallows to heat a little longer. Remove the pan from the oven then top each marshmallow with chocolate squares followed by another graham cracker. 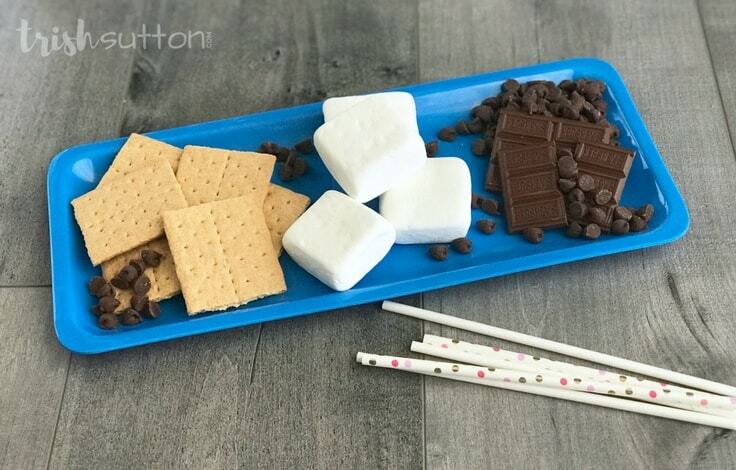 Press cake pop sticks or paper straws into the middle of each S’mores sandwich then refrigerate for 1 hour. Crush graham crackers then set the crumbs aside. Prepare a cookie sheet with a layer of wax paper. After an hour remove the S’mores sandwiches from the fridge. Add chocolate chips and coconut oil (or shortening) to a microwave safe dish. Heat the dish in the microwave for 60 seconds then stir well. If all chips have not melted return chocolate to the microwave and heat for an additional 15 seconds then stir. 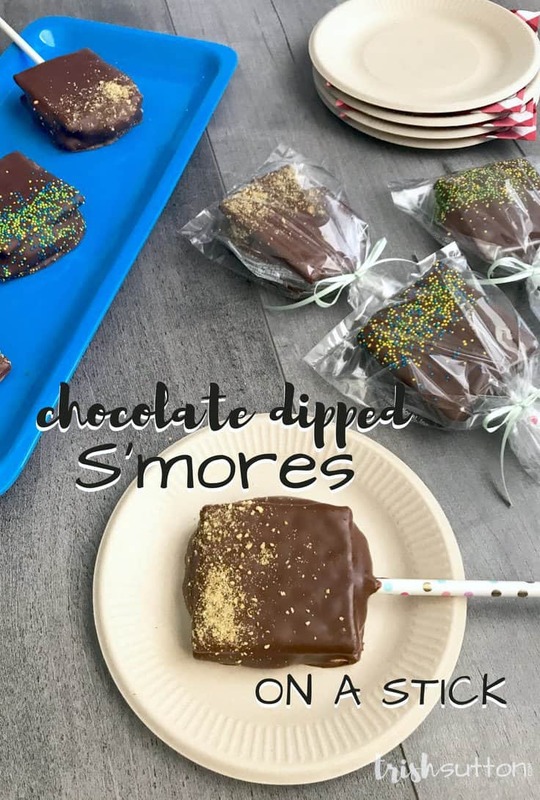 Dip each S’mores on a stick into the chocolate, sprinkle graham cracker crumbs or sprinkles over the sandwiches before the chocolate sets then place them on wax paper. 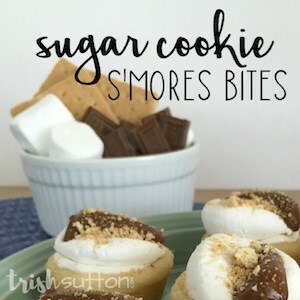 Allow Chocolate Dipped S’mores to rest until set. I usually put mine back in the fridge to set. 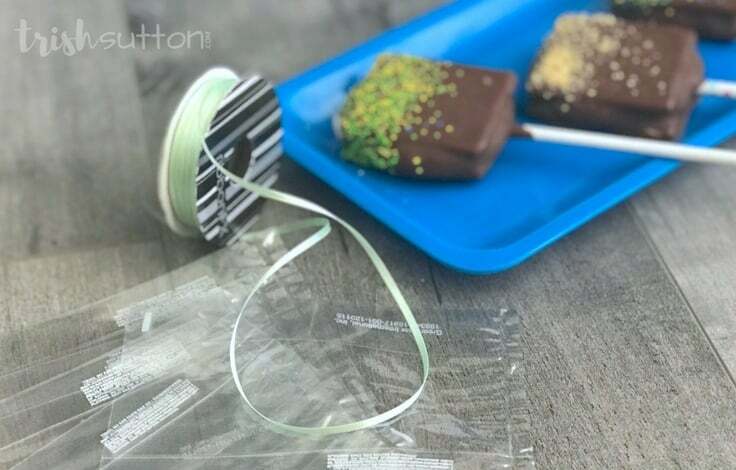 Create party favors by placing each sandwich in a clear bag then tie a ribbon around the stick to secure the sweet treat. Store S’mores in an airtight container in the refrigerator. Preheat oven to 400F degrees then prepare a cookie sheet with parchment paper. Break graham crackers into squares, place them on prepared cookie sheet then top each graham cracker with a marshmallow. Remove the pan from the oven then top each marshmallow with chocolate squares followed by another graham cracker. 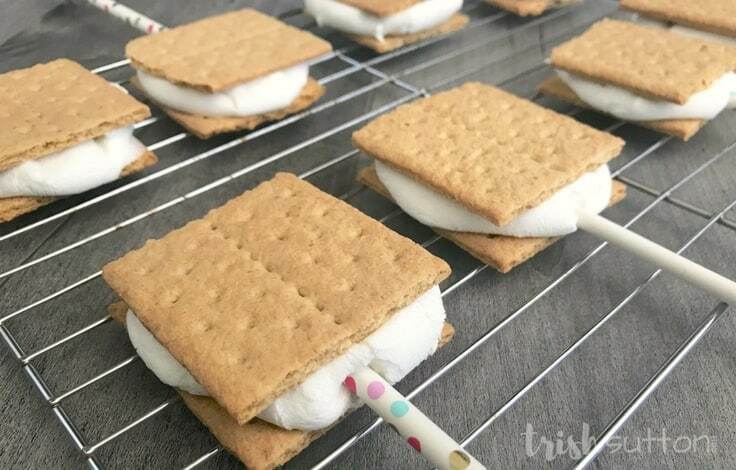 Press cake pop sticks or paper straws into the middle of each S’mores sandwich then refrigerate for 1 hour. Meanwhile, crush graham crackers then set the crumbs aside and prepare an additional cookie sheet with a layer of wax paper. After an hour remove the S’mores sandwiches from the fridge. 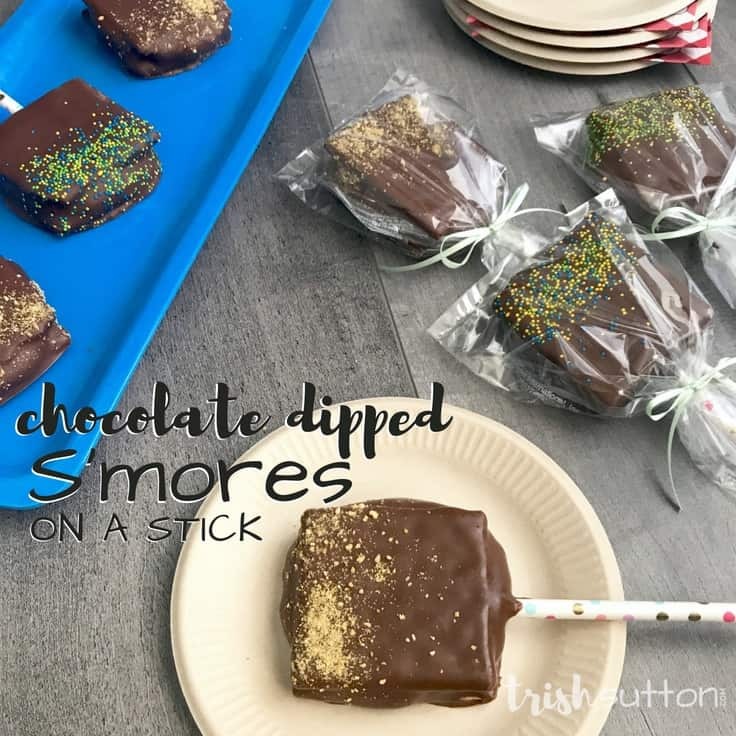 Dip each S’mores on a stick into the chocolate, sprinkle graham cracker crumbs or sprinkles over the sandwiches before the chocolate sets then place them on wax paper. Allow Chocolate Dipped S’mores to rest until set. Keep refrigerated. 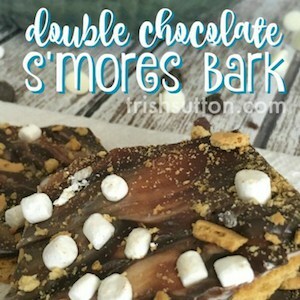 Below are a couple more of my “make ahead” S’mores recipes. Of course, I highly recommend them both! Carrie’s Chocolate Fudge Cake: Marshmallow S’mores Dessert and this Easy S’mores Cake can also be prepared before party time and they both look A-MA-ZING. And, for more new twists on old favorite recipes, check out our round up of 17 Creative Dessert Ideas. 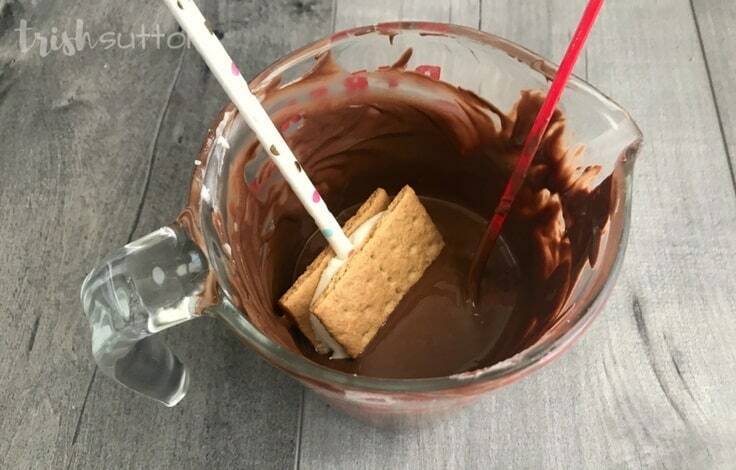 The directions state to place a chocolate square on marshmallows after baking then place the second graham cracker on top, but in your photos, you see no sign of a chocolate candybar square at all. Since you dip them in chocolate chips do you skip the chocolate candy bar part? There is not a picture of the added chocolate squares but I assure you they are there. 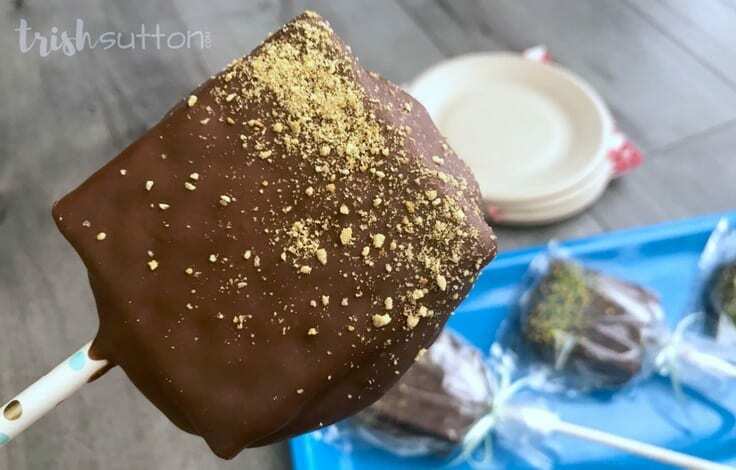 🙂 After making these S’mores on a Stick for friends I asked them for feedback on the chocolate as I was wondering the same thing about skipping on the squares. My friends suggested I not take away the chocolate on the inside. That said, I say if you’d like to pass on the chocolate – give it a try then let me know your thoughts! !